A Titan rocket from the Gemini family prepares to deliver the Viking toward Mars. In this historical photo from the U.S. space agency, the Titan booster, a two-stage liquid-fueled rocket, with two additional large, solid-propellant rockets attached, awaits pre-launch testing on January 20, 1974. It is a member of the Titan family that was used in NASA's Gemini program. 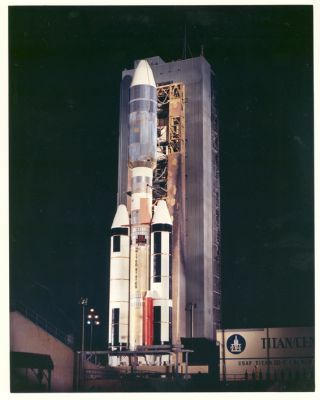 The Centaur is a liquid oxygen- liquid hydrogen, high- energy upper stage used on Surveyor flights to the Moon and on Mariner flights to Mars. At liftoff, the solid rockets provide 9.61 million newtons (2.16 million pounds) of thrust. When the solids burn out, the first stage of the Titan booster ignites, and followed by the second-stage ignition as the first stage shuts down. The Centaur ignites on second stage shutdown to inject the spacecraft into orbit. Then after a 30-minute coast around the Earth into position for re-start, the Centaur re-ignites to propel Viking on its Mars trajectory. Once this maneuver is completed the spacecraft separates from the Centaur, which subsequently is deflected away from the flight path to prevent its impact on the surface of Mars. Shortly after separating from the Centaur, the orbiter portion of the combined orbiter-lander spacecraft orients and stabilizes the spacecraft by using the Sun and a very bright star in the southern sky, Canopus, for celestial reference. For more information about Titan and Centaur, please see Chapters 4 and 8, respectively, in Roger Launius and Dennis Jenkins' book To Reach the High Frontier published by The University Press of Kentucky in 2002.